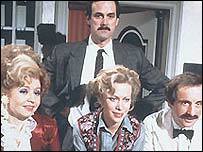 The hotel in Torquay reputed to have inspired the hit comedy series Fawlty Towers could be knocked down and turned into flats. It would be the end of an era for the Gleneagles, which still plays hosts to guests who come to pay homage to the Basil Fawlty legend. The story goes that John Cleese got the idea for Fawlty Towers while staying at the Gleneagles in Torquay, and noticing the behaviour of its proprietor. Although it is more than 20 years since the BBC series Fawlty Towers first appeared, The Gleneagles is still going strong and has regular parties of guests, particularly from Germany and the United States, who come on pilgrimage. But that era may be coming to an end. A property company has submitted a planning application to knock down the hotel and turn it into 25 flats. The developers describe the building as "unattractive with little architectural merit". But no reference is made to the hotel's significance to comedy buffs everywhere.